The Ibaloi have a rich patrimony of vocal expressions, from ritualistic forms of communication and narratives to allegorical songs and witty repartees. These embody the depth and fullness of the Ibaloi persona in their textual contents, most especially those that were conveyed extemporaneously and have been retained in the memory of the community of the elders. This study offers a glimpse of the entire Ibaloi culture, which reflects a much wider cultivation and history of their colorful and rich civilization. 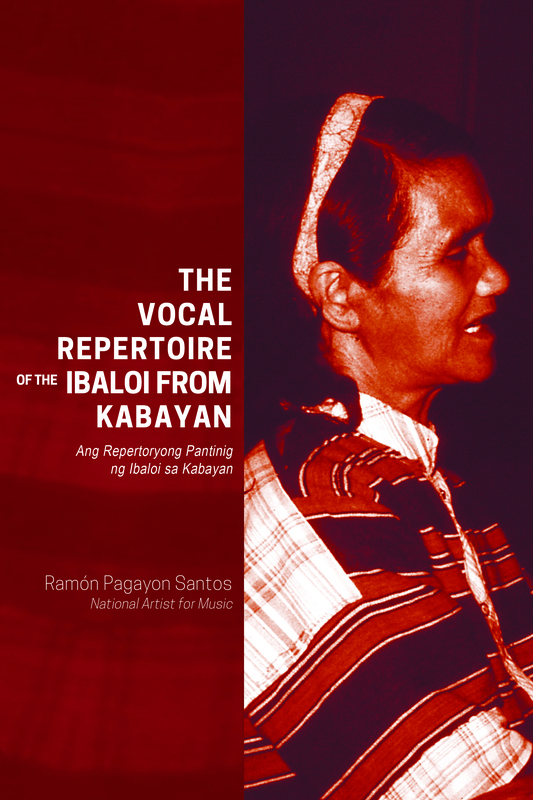 The expressive vocal repertoires of Kabayan, Benguet showcase the Ibaloi’s spiritual dimension including the famous mummies and cave burials as well as their rich cultural heritage as seen in the lavish feasting of the peshit. The Ibaloi have always been known as hardworking people who devote their time to farming and learning. This book highlights another dimension of the Ibaloi: their expressive traditions where the poetry of the word is highly revered. Dr. Ramón Pagayon Santos is currently a university professor emeritus at the UP College of Music. Dr. Santos has been the executive director of the UP Center for Ethnomusicology and has served as the dean (1978–1988) of the College of Music. He was elected as member of the Honor of the Asian Composers League where he became chairman from 1994 to 1997. He also became the vice president (2001–2005) of the International Music Council at UNESCO. As vice president, he was the first Filipino to serve in the highest governing body of the international music community. Santos took up Composition and Conducting at the University of the Philippines. He earned his Master of Music (with distinction) and PhD degrees at Indiana University and State University of New York at Buffalo, respectively. He was a full fellow at the Summer Courses in New Music at Darmstadt, Germany, and undertook postgraduate work in Ethnomusicology at the University of Illinois under grants from the Ford Foundation and the Asian Cultural Council. He has been awarded the Artist-in-Residence fellowships at the Bellagio Study Center and the Civitella Ranieri Center in Italy. Santos’s compositions which belong to a new and experimental group of composers have been conceived along concepts and aesthetic frameworks of Philippine and Southeast Asian artistic traditions, featuring elements from Western and non-Western sources, including various combinations of orchestral instruments, Javanese gamelan, Philippine indigenous instruments, as well as different styles of vocal production. Drawing from the sonic universe of Philippine and Asian musics, he created open-ended temporal and spatial forms such as “Ritwal ng Pasasalamat” and “Likas-An.” His compositions like the “Badiw as Kapoonan,” “Awit ni Pulau,” “Daragang Magayon,” “Ta-O,” “Sandiwaan,” and “Nagnit Igak G’nan Wagnwag Nila” reveal the essence of Asian performing arts that integrate music, dance, drama, and poetry. His works have been featured in major festivals in the Americas, Europe, and Asia. As cultural administrator and educator, he has organized festivals in the National Music Competitions for Young Artists or NAMCYA (1991, 1994, 1997, and 2000); the ASEAN Composers Forum on Traditional Music; the International Rondalla Festivals (2004, 2007, and 2011), as well as the Gongs and Bamboo Festival in 2013. In 2007, Santos was invited to present a keynote paper on “Ethnomusicology and Music Composition” at the Asia-Pacific Music Festival in Wellington, New Zealand. In the field of Musicology, he has undertaken research not only in Philippine and Asian contemporary music, but also studied Javanese gamelan music and dance, and Nan Kuan, and engaged in continuing field studies of Philippine traditional music such as the musical repertoires of the Ibaloi, the Mansaka, Bontoc, Yakan, and Boholano. He was awarded an Asian Public Intellectual Senior Fellowship (2006–2007) that enabled him to do intensive study on transmission of traditional musical practices in Indonesia and Thailand. His book Tunugan: Four Essays on Filipino Music published by the University of the Philippines Press (2005) received the National Book Award in Music for 2006. He was a recipient of the Gawad CCP sa Sining Musika in 2013. Santos was named National Artist for Music in 2014.